With presidential hopeful Hillary Clinton’s campaign headquarters in Brooklyn, many have been wondering where the candidate has been living. So far, her team has kept it under wraps, but we do know that she and Bill were renting a $100,000/month Hamptons mansion in August, and that they own a home in Chappaqua, upstate. If she does make it to the White House, she won’t be the first U.S. president to fancy living in the Big Apple. In fact, our nation’s very first president lived in the inaugural presidential mansion on Cherry Street during NYC’s two-year reign as the country’s capital. In honor of Presidents Day, we’ve taken a look at this original New York presidential residence, as well as those that followed. 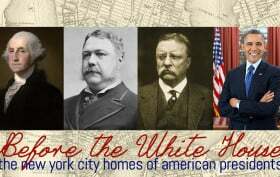 Where are the presidential homes in NYC?